Sat, Aug 4, 2018, 08:09 pm SL Time, ColomboPage News Desk, Sri Lanka. 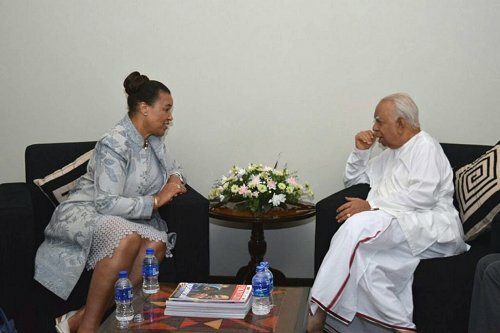 Aug 04, Colombo: The visiting Commonwealth Secretary-General Patricia Scotland has assured that the Commonwealth will continue to support Sri Lanka's new Constitution making processes, when she met with the Leader of the Opposition and the Tamil National Alliance R. Sampanthan on Friday (3rd August 2018) in Colombo. Briefing the Secretary-General Mr Sampanthan pointed out that even though the war has come to an end, there is no complete peace and harmony among the people and the unity government is slow in delivering the promises it made. "People had a great deal of hope with the change of Government particularly the minorities. They expected the government to deliver on the promises it made both locally and internationally. A new Constitution which will alter the structure of the governance and give more powers to the regions, ascertainment of truth and justice, reparation, dealing with missing persons, return of civilians lands occupied by the armed forces, release of people held in custody under the draconian Prevention of Terrorism Act are some of those promises, but the delivery on these matters has been slow and inadequate," said Mr Sampanthan. Mr Sampanthan highlighted that there is a commitment to make a new Constitution. "A unanimous resolution was adopted in Parliament in this regard, on account of political factors there is a delay on the part of the Government in pursuing this matter," said Mr Sampanthan. "There were reasons why this country faced a war, one cannot address these reasons by not being firm, one cannot abandon these issues being addressed because of extreme elements. The Government must take a firm stand and lead the country in the right direction. Adopting a new Constitution will be a big step in taking the country forward," he said. 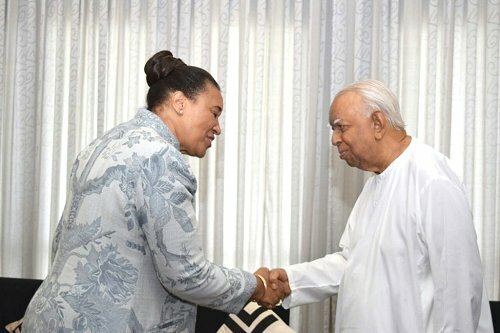 The Secretary-General briefed the Opposition Leader on the continuous support provided by the Commonwealth to Sri Lanka to promote Democracy, Rule of Law, Good Governance and Environmental related issues and said that the Commonwealth will continue to support the new Constitution making processes. Further, the Secretary-General appreciated Mr Sampanthan for his moderation and for being an ambassador for peace. Assuring his continuous support Mr Sampanthan said, "we will extend our fullest support to achieve true peace and harmony in this country". Further Mr Sampanthan urged that the International community including the Commonwealth has a role to play in achieving harmony amongst the people.